Protesters occupy Independence Square, December 2013. March 2, 2014 – Links International Journal of Socialist Renewal -- These two commentaries were written in January and February 2014 – before the fall of the Viktor Yanukovich regime and subsequent events -- and have only just been translated into English. They are published at Links International Journal of Socialist Renewal as they offer insights into the thinking of an important part of the revolutionary left in Russia. 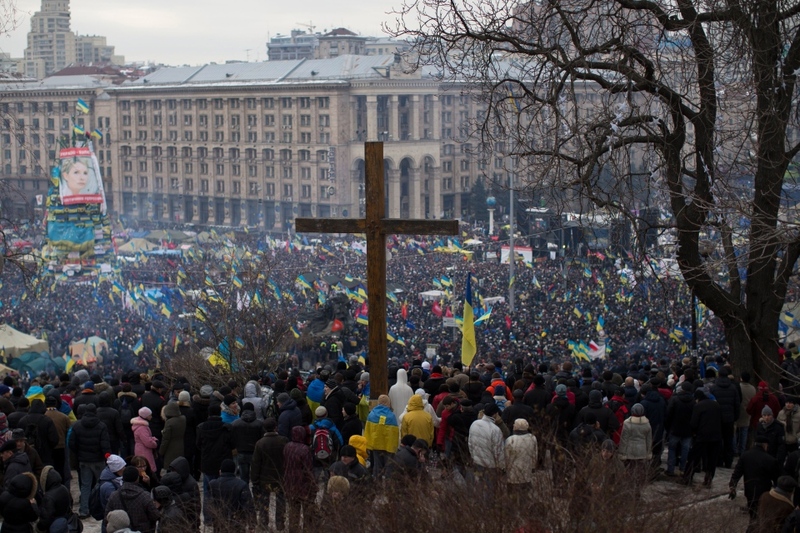 January 21, 2014 -- The events unfolding in Kiev present many people on both sides of the Russian-Ukrainian border with a very unpleasant dilemma. If we cast aside the sentimental raptures over the latest “revolution” (how many is this now?) in our neighbouring state, along with the paranoia of the Russian protectors who adore any functioning authority and have a panicked fear of any and all change, then the discussion overall boils down to a choice between two evils. On one side is the corrupt, irresponsible administration of Ukraine's president, Viktor Yanukovich, which is becoming more authoritarian by the day. On the other side are the nationalists and ultra-rightists, who are violent and aggressive, no less corrupt, and who in no way resemble democrats according to any understanding of the word. Most of the population, who at first sympathised with the protests, are now trying to keep their distance from the nationalist warriors, not so much from ideological considerations as for the simple reason that keeping company with such people is repellent and not without danger. Both sides, as if deliberately, are doing everything they can to alienate the support of people of intelligence and goodwill. It is enough for one side to carry out some stupidity or provocation, and the other immediately finds a way to outdo its rivals in this competition. The destruction by nationalists in Kiev of the monument to Lenin aroused the anger of residents, most of whom feel no sympathy whatever for communists. But it was enough for the pendulum of public sympathies to swing a little in the direction of the authorities for supporters of Yanukovich to introduce into the Supreme Rada a whole packet of anti-democratic legislation, that might have been compiled deliberately to ensure that social forces mistrustful of Independence Square would take part in protest. Meanwhile the opposition, raising a great racket on this score and with the technical ability to frustrate the voting for some reason undertakes nothing of any seriousness in the parliament. Perhaps this is out of incompetence and irrationality, but it may also be for the reason that it hopes to use the repressive measures against its opponents should there be a change of government. Neither the authorities nor the opposition enjoy the support of the majority of the population, and more important, neither side has a program that would give it any prospect of winning this support and of constructing a broad social base. The problem lies not only and not so much in the notorious antipathies of east and west in Ukraine, as in the absence even of any attempts to suggest a socio-economic program aimed at integrating society, improving the conditions of life, reducing unemployment and developing the economy. The monsters that are waging a struggle for power in the Ukrainian capital are constantly changing places, like partners in a dance. All of them now have spent time in power, if not on a national then at least on a local level. All of them, including the neo-fascists from the “Svoboda” party, have managed to be caught embezzling. All of them show an identical determination to defend and maintain the existing socioeconomic order, whose crisis is obvious. However events now develop, it can be stated that the specifically Ukrainian model of democracy, built on an equilibrium between two oligarchic blocs, is coming to an end. Whichever group wins out in Kiev, it will be able to hold onto power only by establishing a harsh authoritarian regime. In this situation, the question of who should be considered the less and who the greater evil is simplified immensely. The “greater evil” will inevitably be the group that achieves victory. Meanwhile, we shall be able with complete justification to designate the group that goes down to defeat as the “lesser evil”, since unlike the victor, it will not succeed in realising its destructive potential. Does this mean that Ukraine’s position is hopeless, and that catastrophe is inevitable? To draw so pessimistic a conclusion would still be somewhat premature. The triumph of either side will guarantee a great calamity, but like the previous experience of Ukrainian politics, the events of the recent period show that the contending groups are capable of simply blocking each other’s path. If neither the authorities nor their opponents manage to prevail unambiguously in the present conflict, the country will be faced with a drawn-out period of instability, perhaps even of political chaos. But this would be better that a decisive victory by one of the groups, which would then impose its dictatorship. Under conditions of prolonged instability, the chance will appear for the assembling of new social forces that call for a genuinely radical renewal of the state and social system. It is rather like the well-known joke about the Whites, Reds and “Greens” who fought interminably in the forest, until the forester came and drove all of them out. The question lies in how, and how soon, Ukrainian society will be able to give birth to this “forester”, and what role in this process will be played by the left organisations, which have been happy to stay on the sidelines of the present battle of political monsters. Refusing to be drawn into this conflict, however, does not mean abstaining from struggle. Passivity has never been a recipe for success, even though to participate without thinking in the actions of alien social forces remains a guarantee of failure. Forces that aim genuinely at democratic change will organise and act independently, putting forward their own demands. This is already occurring, as for example in the strike by students of the Kiev-Mogilyansky Academy who are demanding the repeal of the anti-democratic Yanukovich laws, but who are not joining with the ultra-rightwing warriors on Independence Square. Perhaps this is only something local and episodic, contrasting with an unpleasant dynamic overall. Still, it provides some hope for the future. February 3, 2014 -- The crisis that has arisen in Ukraine, involving a contest between a reactionary government that is becoming more authoritarian by the day and a no less reactionary opposition with openly fascist tendencies, has created something close to intellectual stupor on both sides of the border. The range of views extends from a readiness to take part in protests and demonstrations of any kind – regardless of their aims, purpose, ideology and perspectives – to calls for supporting the existing authorities as a “lesser evil”. In Russia these arguments have been superimposed on an inconclusive discussion focused on the lessons of the events of 2011-2012, though the effective results of the movement at that time are perfectly obvious: everything ended in total failure. The only questions are whether the left could have acted differently from the way it did, and how the forces became redistributed on the basis of the outcome of the events (against the backdrop of a general decline of the movement, by no means all its participants finished up losing; some, to the contrary, strengthened their positions). But as we know, Ukraine is not Russia. Contrary to the views of the liberal intelligentsia, the distinction is apparent not in any greater love of freedom or special passion on the part of our western neighbours, but in the fact that the ruling class in Ukraine simply has considerably fewer resources at its disposal. This determines the specific model of oligarchic democracy to be found in Kiev. The leading Ukrainian clans, unlike the Russian corporations, are unable to reach agreement and to divide the country up in such a way that everyone has enough and there are no pretexts for open conflict. In Russia it was not Putin’s authoritarian inclinations, but the objective ability of the ruling groups to satisfy all the big players (more or less) that allowed the relative stability of the decade from 2000. The same consideration underlay the sudden outburst of crisis in 2011, when this ability of the authorities was placed in doubt. Meanwhile, the difference in the resources available to the ruling classes of the two countries determines the social climate as well. The reason we Russians have tolerated our problems for longer is not because we are less passionate, but because our situation is objectively better. Nevertheless, the rapid exacerbation of the social crisis in 2014 threatens to end this state of affairs, even to the extent that “the dancers change places”. If political crisis and open social protest break out in Russia, everything that has happened on the squares of Ukraine will look like child’s play. Precisely for this reason, the question of the “lessons of Ukraine” is extremely pertinent to the Russian left. The question is not about what our comrades over the western border might or might not be able to do, but about the conclusions for the future that the left organisations of both countries manage to draw from what has occurred. In the larger framework, three major positions can be distinguished in the Ukrainian discussion, with more or less distinct political organisations and currents standing behind them. As in Russia the position of the liberal left consists of appealing to the movement to come together, in the Ukrainian case on Independence Square, and “despite the dominance there of the right wing”, to join with the dominant nationalists and fascists in an ideological struggle for hegemony and for “influence over the masses”. This is the kind of declaration we hear from certain members of the “Left Opposition”, whose articles and opinions are published enthusiastically on the Moscow site Open Left. Here we see a logical continuation of the line pursued by left liberals in Russia during the protests of 2011 and 2012, only taken to the level of the absurd. In Russia, the entire discussion, along with the tactics pursued, was defined by the fact that the left from the outset was an important element in the overall movement. Significant numbers of the demonstrators took their lead from the left, and the latter also enjoyed a definite authority and influence among the mass of protesters. To a substantial degree these opportunities were let slip as a result of the position taken by the leaders of the Left Front, but large numbers of the activists and organisations distanced themselves in good time from this position, getting the Forum of Left Forces to resolve to boycott the coordinating council of the opposition. The upshot was that as a result of the crisis of 2011 the ideological weight of the left in Russian society increased; even people who for 20 years had pretended we did not exist were obliged to notice us. But we shall scarcely be able to say the same about the outcome of the current events in Ukraine. There is also another fundamental difference. In Russia in 2012 we faced a struggle between leftists and liberals for hegemony over the protests, under conditions in which the nationalists among the protesters were a relatively marginal force. On Independence Square in Kiev the left is forced to contend with nationalists and fascists, who while they do not control everything by any means, nevertheless hold a commanding position. While it is possible to debate with liberals, talking to the ultra-right is pointless, simply because rational discussion on the level of arguments and counter-arguments is quite impossible. The whole structure and culture of the ultra-right movement is founded on a completely different principle; hegemony in these circles does not rest on theoretical or analytical constructs, but on force, to which another such force has to be counterposed. In plain terms, cooperation with liberals, however doubtful from an ideological point of view, is a much lesser “sin” than collaboration with the ultra-right. But the question is not one of abstract “sins”. If such a course opened up any prospects at all for the left, it would be possible to discuss even alliances that were quite strange from a theoretical point of view. The point, though, is that no such prospects exist. The left on Independence Square in Kiev is invisible and inaudible. A few leftists, of course, were earlier beaten up and chased off. But at the moment, the left is so insignificant in terms of its presence and influence that no one even bothers any more to beat up its members. For the most part, the Ukrainian left exists solely within its own imagination. This, of course, does not mean that the left will never again materialise as a political force, but the first condition for this will be that it recognises the actual state of affairs. Obviously, the people on Independence Square are not just benighted nationalists and followers of Stepan Bandera. But there is simply no niche there for the left to occupy. Technically and in terms of the situation, no one apart from nationalists and Banderovists [Banderovists were Nazi collaborators responsible for mass murder] can come out ahead. These are the only people who are finding the “emerging possibilities” suited to their ends. Meanwhile, the alternative to a victory for Independence Square is a dictatorship under Yanukovich; in this case, the position of democracy would be far worse than before the protests began. Finally, the prospect of a “national reconciliation” becomes more real with each day that passes. This would involve either a compromise between the Donetsk thieves and the pogrom-instigators of Lvov (the most likely variant), or else a semi-disintegration of Ukraine, not along east-west lines but according to provinces (not the worst possible variant, and also quite conceivable). If the boundaries of the possible are to be expanded, the limitations of the present situation must first of all be recognised. Further, we have to understand our real position. Instead of weighing one policy that is correct in the abstract against another policy variant, also correct in the abstract, we have to observe the strategy and tactics of the particular forces that are present, while also considering the practical circumstances. Articles by many Ukrainian leftists fail to give any thought to this. Worse still, in rehashing these discussions, Russian commentators uncritically repeat the same abstractions. It is impossible not to be reminded of Plato’s famous “reflection of the reflection”. If organisational, ideological and media bridge-heads have not been created earlier, there is no prospect of changing anything through attempts to involve ourselves in a process that is already under way without our participation. The left was able to play a certain independent role in the Russian protests of 2011 and 2012 because structures, leaders, activists and organisations existed that were known at least in certain circles, and that exercised authority beyond their own narrow domains. If similar bridgeheads have not been created in advance, then it is pure naivety and self-deception to hope that the rightists might be outplayed on Independence Square, that a public fascinated by the struggle between the government and the opposition might be drawn over to the side of the left, and that “leaders who have discredited themselves” will be repulsed. In some situations the only genuinely "practical" course is to fight the temptation to undertake action without delay, and instead to "sit and wait", and to engage in patient critical analysis. It is amusing that in this case the people who turned to Žižek were not the glamorous leftists from Open Left or the Left Opposition, but their traditional opponents from Borotba. This, of course, is not the main problem. Strictly speaking, Žižek’s point of view at least has the right to exist. But things that are possible and allowable for an individual thinker are catastrophic and impossible for an organisation. If the latter merely sits and waits, immersing itself in the subtleties of critical analysis, then the result of its waiting will be that it collapses or turns into a club of armchair intellectuals incapable of practical work. Properly speaking, this is the threat that now hangs over the Borotba party. The analysis of the situation that is to be found on the site Liva, which is close to the party, is unquestionably convincing and well argued, but for the most part it fails to answer the question of “what is to be done”, even on a tactical level. There is nothing terrible about remaining in a minority; what is terrible is to remain unnoticed. Disagreement and criticism become facts of our collective existence only if our views become known, if not to a majority then at least to some significant part of society. It is only then that our correctness may in retrospect acquire at least some political meaning. Taking into account the fact that the situation of the left at the moment does not allow victories, the need is all the greater for us to think and act strategically, to establish bridgeheads for the stage that follows, to conduct struggles on our own terrain that we ourselves have prepared, to find places and opportunities for aggressively propagandising our ideas, to make use of the weaknesses of the authorities in order to compel the ruling groups to address new topics on a local level, and to advance our own demands. This might involve actions proceeding in parallel with Independence Square, struggles around specific social problems, or even direct conflict with the nationalists in order to win a place on the square. This latter route has been taken by a section of the anarchists, whose ideological views are, at a minimum, far less developed and nuanced than those of the Marxists of Borotba. For Russian leftists, following events from a distance, the news of violent clashes between anarchists and fascists in Lvov and Kharkov could only appear as a ray of light in the darkness of the Ukrainian crisis. But here we have to be extremely cautious, avoiding illusions and idealisation. In the last year we have put particular efforts into developing the striking power of the Kharkov movement. This helped us to hold out on the square in Kharkov during the attacks on our ranks on 19 January. After we fought off an attack by the local fascists in full view of most of the participants on the square in Kharkov, the provocations by the rightists ceased. The factor of violence was by no means the only one at work, but it was far from unimportant. My advice to everyone is to take part in sport, preferably martial arts under conditions approximating to those of the streets. This advice is unquestionably valuable, but as a political program it is clearly insufficient. Here one might dream, in the manner of Agafya Tikhonovna in Gogol’s A Wedding, that “the lips of Nikanor Ivanovich might be set against the nose of Ivan Kuzmich…” On the whole, if the Marxist analysis of the Borotbists could be combined with the aggressive tactics of the anarchists… But the reality is that no such combination is occurring, and it cannot come about in mechanical fashion. Only through carrying on work in mass social movements, through the creation of new civil, trade union and other independent organisations, and through the active popularisation and propagandising of this struggle can political bridgeheads for the left be created, along with opportunities for the integration (and mutual re-education) of various political currents. This means, however, that the left cannot be idle, and cannot simply bustle about on Independence Square (or around it), but has to make use of the temporary weakening of state control and of the vacuum of power that is now emerging in order to establish its own autonomous spaces. On the basis of these, it will be possible to enter into a new, “post-square” stage of political life. Both in Ukraine and in Russia, oligarchic groups are now engaged in the struggle for a place at the feed trough. Meanwhile the historic task on which the development and even the simple survival of our countries depends can be summed up as smashing this very feed trough. Sooner or later this task will be recognised, if not by the majority of the population, then at least by a large proportion of it. Then the left will get its next chance. The main thing is to make certain that this chance is not let slip in as clumsy a fashion as all the previous ones.